In its 2014 session, held in February, world regulatory body the International Seabed Authority’s (ISA’s) Legal and Technical Commission was preparing draft regulations for the exploitation of polymetallic nodules in three areas approved for deep-seabed exploration worldwide. The first of the awarded exploration licences will expire in 2016. The ISA has, thus far, granted 14 of its 166 member States exploration licences in these three areas. Five other exploration plans have been approved, but have not yet been concluded in the form of a contract, while a further seven exploration plans are being considered by the ISA Legal and Technical Commission. In one of the three deep-seabed exploration areas currently permitted by international law, China, South Korea, Germany and India are among the States prospecting for polymetallic nodules and sulphides in the Central Indian basin and the Indian Ridge, far to the south-east of South Africa. They are part of the international seabed mining exploration projects looking for polymetallic nodules along enormous undersea ridges, vast abyssal plains and geological fault lines in the Central Indian basin of the Indian Ocean, north-east of Mauritius and Réunion; and in the Equatorial North Pacific Ocean, south-east of Hawaii. Meanwhile, exploration for polymetallic sulphides is being undertaken in the Mid-Atlantic Ridge of the Atlantic Ocean and in the Southwest Indian Ridge, south of Madagascar. Polymetallic nodules are deposits or accretions partially buried in deep-seabed sediments that contain manganese, nickel, cobalt and copper. Polymetallic sulphides often precipitate from deep-sea hydrothermal vents found along the mid-ocean ridges and contain copper, zinc, lead, gold and silver. Deep-seabed mining licences to explore for cobalt sulphides, manganese nodules, polymetallic sulphides and cobalt-rich ferromanganese crusts have been awarded to various international mining companies. Further, commercial companies have been granted rights by several countries, including Ghana and Papua New Guinea, to mine the seabed in their exclusive economic zones for gold, silver, zinc and copper using dredging, mining and oil and gas equipment and techniques. In Southern African waters, diamond company De Beers, coastal mining company Panda Marine and South African State-owned Alexkor mine diamonds from the coast and seabed on the West Coast. Off the coast of Papua New Guinea, Canadian deep-seabed miner Nautilus Minerals – the first company to receive an ISA exploration licence – found that indicated mineral resources are 7.2% copper, 5.0 g/t gold, 23 g/t silver and 0.4% zinc, while inferred mine- ral resources are 8.1% copper, 6.4 g/t gold, 34 g/t silver and 0.9% zinc. In its technical study towards developing a regulatory framework for polymetallic nodule exploitation, the ISA reports that “the renewed interest in the potential for commercial exploitation of deep-seabed polymetallic nodules is driven by an increase in demand for metals, a rise in metal prices and a decline in the tonnage and grade of land-based nickel, copper and cobalt sulphide deposits, as well as technological advances in deep-seabed mining and processing”. In the past, seabed and subsoil beyond the limits of national jurisdiction were considered unregulated territory until the United Nations declared them the common heritage of human- kind in 1970. Since the 1982 United Nations Law of the Sea, the seabed can only be subjected to mining “for the benefit of all human- kind”, in accordance with the founding charter of the ISA. Seabed mining also does not require additional roads, surface ore transport systems, buildings or other permanent infrastructure that could disrupt indigenous or native populations or habitats. Meanwhile, the ISA has funded research projects to examine the potential impact of seabed mining and how to assess and mitigate these effects. Exploitation regulations will include obligations and recommendations to reduce any potential environmental impact, the organisation states. Regulations for limited sampling exploration in international waters include significant environmental and deep-sea chemosynthetic ecosystem monitoring and management obliga- tions. State companies conducting exploration must collect baseline environmental data during this phase and during exploitation to develop their environmental monitoring plans and to determine the environmental impact of exploitation. The data must be analysed to improve understanding of the cumulative environmental impact of all aspects of exploitation. Analysis of the data collected in the environmental monitoring programmes during exploitation will provide important feedback to, and inform potential modification of, environ- mental monitoring plans and systems. The ISA aims to establish exploitation regulations that will be modified and improved as it receives feedback from environmental studies during exploitation. “Because exploitation will not be a public enterprise, questions immediately emerge about how to appropriately divide both profit and risk. These, in turn, raise difficult resource rent questions about capturing windfall profits and rents in the name of social justice. Both environmental destruction and the division of rent must somehow be addressed in the eventual fiscal package,” the ISA warns. There are several deep-seabed mining techniques, depending on the mineralisation of the resource. Some companies use a seabed-crawler machine that pumps the mineral-bearing gravels to the surface. Other techniques use cutting machines, similar to those used for coal mining, that cut mineral-bearing rock on the seabed before the resultant sand, gravel and silt are collected by another machine and pumped as a seawater slurry to a production support vessel on the surface. Processed materials are then returned to the deep-sea area being mined. However, the techniques may increase turbidity of the water column in the area of exploitation and may negatively affect the filter- feeding benthic organisms living on the seabed at extreme depths. Coastal alluvial diamond mining company Panda Marine claims that marine mining has a low environmental impact, when practised responsibly, and the disturbance of the seabed and soils release nutrients that provide an additional boost to native animal populations, especially zooplankton that can help to boost the depleted Atlantic fish stocks off the western coast of Southern Africa. Canadian marine miner Marine Mining Corp, exploring for gold off Ghana’s coast, notes that its operations require no chemical alteration of the rocks – the sands are brought up to the surface, gold removed by gravitational separation and the remaining materials returned to the seafloor. Marine Mining says a review of similar ope- rations around the world reports little or no environmental concerns, even off heavily popu- lated and monitored beaches, such as Florida. “In addition, the company has been investigating existing environmental problems on the coast to see whether mining operations can be tailored to ameliorate them. Many points along the coast have been modified to suit the tourist industry, and one of the results has been coastal erosion, which now endangers a number of villages. An offshore mining project may pump offshore sands to the beach to replenish them, or gravels and boulders to buffer them,” highlights Marine Mining Corp exploration manager Michael Gipp. De Beers Marine Mining, mining off Namibia’s coast, carries out daily environmental management at an operational level and ensures legal compliance on environmental obligations. The ISA Marine Mining Code notes that, despite States having explicit marine environmental obligations, there is little national environmental regulation of marine mining, especially beyond the territorial sea. Further, other than the ISA’s marine environmental work related to marine minerals exploration and exploitation in the areas being explored, there is none in any marine area beyond national jurisdiction. “By developing and promulgating the code, the marine mining industry is assuming a share of the extensive responsibilities for marine environmental protection that are assigned under international law to States. The code also enables the marine mining industry to meet the requirements for regulatory predictability and reduction of risk, including environmental regulations and risks, and in facilitating financial and operational planning,” the ISA notes. Further, a critical problem is “high grading” that, while not allowed, is “an all too frequent practice” involving a mining operation targeting only high-grade portions of reserves to maximise profits and minimise expenses, leaving significant, but lower-grade, portions behind in their concession areas. Therefore, the ISA says: “A ‘whole of the deposit’ approach to nodule exploitation is required that includes a comprehensive resource and reserve assessment of the proposed mining area and the adoption of a sequential mining plan that maximises reserve recovery, utilisation and metal recovery. The ISA technical study for exploitation regulations recommends a phased licensing approach to grant three-year fixed-tenure mining licences to companies, which will improve the accountability of companies throughout deep-seabed mining operations through periodic review and analysis of performance. Proposed regulations for exploitation include granting provisional mining licences after receiving detailed bankable feasibility studies, which must be preceded by a pilot mining ope- ration to prove economic, environmental and technical analyses done during exploration. “An application for a tenured mining licence would include the data, information, analysis and conclusions of the detailed bankable feasi- bility study and full environmental-impact assessment and proposed work plans. This will provide data, information and analysis allowing the ISA to determine whether a full-scale mining operation could be undertaken in an acceptable and minimally environmentally invasive way,” the authority concludes. Costa Rica’s rainforests are some of the most amazing places on earth. So when a Canadian mining company wanted to put an open pit, cyanide-leach gold mine in the middle of its most pristine forest, Costa Rica didn’t just say no. They said hell, no. So what did the mining company do? They sued Costa Rica for $100 million lost profits. But Costa Rica is the tip of the iceberg. Pharmaceutical giant Eli Lilly sued Canada to increase drug prices. Philip Morris has sued Australia over cigarette warning labels. The list goes on and on — and under proposed trade agreements like the Trans-Pacific Partnership, we’ll see an explosion of these kinds of lawsuits. But fighting corporate bullies is exactly what SumOfUs was set up to do. Using the Internet to organize, our worldwide membership has the collective power to stand up to big corporations, so countries like Costa Rica don’t have to face these corporate bullies alone. Shortly after Infinito Gold proposed its mine, Costa Rica banned the kind of destructive open pit mining they wanted to do. And you’d think that would be the end of it — but because of a so-called free trade agreement between Canada and Costa Rica, many experts think Infinito Gold will win its lawsuit. If it do, Costa Rica will have to pay a huge sum of money just because they decided to protect their forests. Costa Rica is just one example of a growing trend of corporations bullying sovereign governments — and it could get a lot worse because of similar trade deals like the Trans Pacific Partnership (TPP) or the Transatlantic Trade and Investment Partnership (TTIP) that could affect virtually all of Europe, Australia, Asia, and North and South America. So we’re fighting back. First, we’re blowing the whistle every time a corporation tries to bully a nation like Costa Rica. Second, we’re organizing to block new trade deals like the TPP and TTIP. Niuminco has restarted pilot mining at its Edie Creek mine in Papua New Guinea after receiving a 10 year renewal of mining lease ML 144. The company has also acquired a 100% interest in Exploration Licence EL 1365 that adjoins to the north and west an Exploration Licence held by Morobe Mining Joint Venture, which in turn surrounds Niuminco’s Edie Creek mining leases. EL1365 is also south of MMJV’s Hidden Valley gold and silver mine. Pilot mining, large scale sampling and gold production at Eddie Creek recommenced last week at the 0.9 square kilometre mining lease. Production levels are expected to rise to between 90 ounce and 120 ounces of gold per month from 90 ounces from April 2014, up from the current rate of about 30 ounce to 40 ounces of gold per month. In addition, the proposed Stage 2, 10 hole, 2000 metre drilling program designed to test the Karuka- Enterprise Stockwork zone and Enterpise Diatreme/Maar on this lease is also scheduled to commence in April 2014. At the planned level of gold production (and sales), both the company’s projected operating and exploration expenditures for the next 12 months are intended to be funded from internal cash flow. Kula Gold has been awarded the Environmental Permit for its Woodlark Island Gold Project in Papua New Guinea. Importantly, it clears the way for the PNG Mining Advisory Council to recommend the grant of the Mining Lease to the Mining Minister. Woodlark Island has a 2004 JORC Resource of 2.1 million ounces of gold and an Ore Reserve of 766,000 ounces. The 9 year Project is based around three open pit mining areas and a 1.8Mtpa gravity and carbon in leach plant. High gravity gold and total recovery of above 90% is achievable in years 1 to 6, leading to OPEX of US$730 per ounce. CAPEX is estimated at US$160 million and life of mine OPEX is US$812 per ounce. Strong exploration upside has also been identified. Fantastic news! On Wednesday, February 26/2014, the Canadian Environmental Assessment Agency released a NO decision from Environment Minister Leona Aglukkaq in response to Taseko Mine’s second proposal for proposed “New Prosperity” open pit gold and copper mine. “The Minister of the Environment has concluded that the New Prosperity Mine project is likely to cause significant adverse environmental effects that cannot be mitigated. The Governor in Council has determined that those effects are not justified in the circumstances; therefore, the project may not proceed. significant adverse cumulative effects on the regional grizzly and moose populations, unless necessary mitigation measures are effectively implemented. Friends of the Nemaiah Valley congratulates the Minister on this decision. Too much time and energy has gone into opposing this project only to get the same results as in 2010. This project has now been rejected for the third time, twice under the Canadian Environmental Assessment Act. There is no room for another application for this wrong mine in the wrong place by the wrong proponent. The Minister’s decision is clear and unequivocal – it’s over. Donna Barnett, Cariboo-Chilcotin Liberal MLA says in this video clip, ” The company has spent 20 years and $100 million dollars….this cannot go on….we need to figure out ways we can go forward.” Mines Minister Bill Bennett and Taseko’s Brian Battison should listen to that advice. 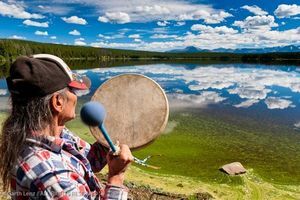 FONV says “Sechanalyagh” to the Tsilhqot’in people who have been steadfast in their determination to protect this special and sacred place from the infringement of this most inappropriate proposal. We also give a huge Thanks to all of our supporters and other ENGO’s across the country. This has been a David and Goliath struggle. What about the pre-emptive judicial review Taseko filed after the Panel’s negative report last October, contesting what they considered to be a faulty understanding of their technical submission? The Minister’s statement is clear: the findings of the Panel were accepted unconditionally. There would be severe adverse effects in a number of areas if the mine proceeded as proposed and, given that this is Taseko’s second and “best” proposal, there is no way the mine can proceed. FONV is confident that this mine is now dead. We now await the Supreme Court’s decision in the Tsilhqot’in title case that was heard in Ottawa last November. We expect an equally positive outcome in that case. TO ALL those who have never visited Madang, here are some facts to add onto your knowledge about people and places…. The biggest Chinese investment in PNG, Ramu Nickel Mining, is found in this province. All the stores in Madang are owned by Asians except for two: Christian Books Melanesia (owner unknown ) and Yoko Trading (a very small store owned by a Chimbu fellow). The most (seemingly) expensive building in Madang, they call it “glass house”, is owned by the Chinese state-owned MCC (China Metallurgical Group Corporation). The biggest fishing cannery and the largest number of fishing vessels in Papua New Guinea are owned by Asians. The vast Trans-Gogol Valley and Ramu Valley, home to virgin rainforest and tropical hardwood, is logged by Asians started by Japan New Guinea Timber (JANT) decades ago and now continued by other logging giants. I have no intention of being racist but the list (and I could go on) is phenomenal. One wonders if there are any politicians in Madang who realise these facts and might be responsive to the plight of the vulnerable. Foreign policy pursuits these days do not necessarily reward but offer costs that are detrimental. Only in Madang have I seen headlines about politicians winning elections while in prison, driving on to runways to stop moving planes, driving bulldozers into settlements, and arriving in prison for failing to control violent supporters. In a few months’ time, Madang’s long-awaited and much-anticipated Pacific Marine Industrial Zone will commence – built by Chinese using Chinese loans for Filipino companies and their PNG cohorts to excel whatever they do best in. What’s left of Madang? And what’s left for it? Ironically, for the first time in history, the flying foxes have deserted the tourist town for destinies and reasons known only to Mother Nature. With good manners, they have paved way for new migrants to conquer the town under the watchful eyes of all the Matus and Kukurais, the so-called chiefs. Only God will save Madang from Asianization but in the meantime, let us ponder on where exactly has our foreign policy gone wrong. Five New Caledonian environmental groups have won nearly half a million US dollars in compensation from the Vale nickel company over a major acid spill at its plant five years ago. The court of appeal in Noumea determined the sum after the groups last year demanded Vale pay 7.8 million US dollars for the damage. The groups took the action after considering the original fine was too insignificant and insisting the company needed to be hit in the pocket. They calculated the demanded sum as being the equivalent of one Pacific franc for every square centimetre affected by the spill. Vale is yet to react to the court ruling. Over the years, there have been several incidents at the Vale plant, the latest dating back to November when a burst effluent pipe through a World Heritage lagoon closed the plant for several weeks.